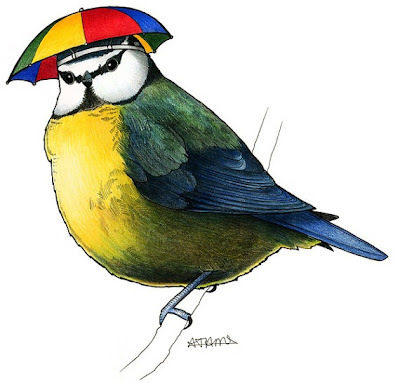 Birds In Hats. Birds. In hats. A concept so ludicrously brilliant that I'm very pleased indeed that Alice Tams has taken it and illustrated it so beautifully. Regardez Monsieur Penguin in a fez. 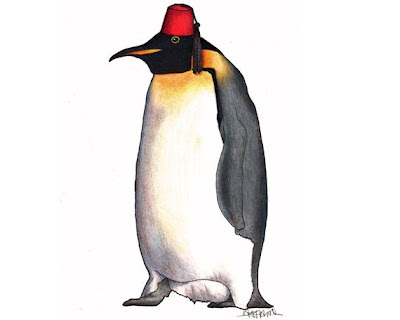 Forget The Doctor, this is the coolest fez wearing I've seen in a long time. He's available as an A4 print for £10 or as a greeting card for £2.50. I love penguins but I do not love pigeons. Seriously, they scare me. 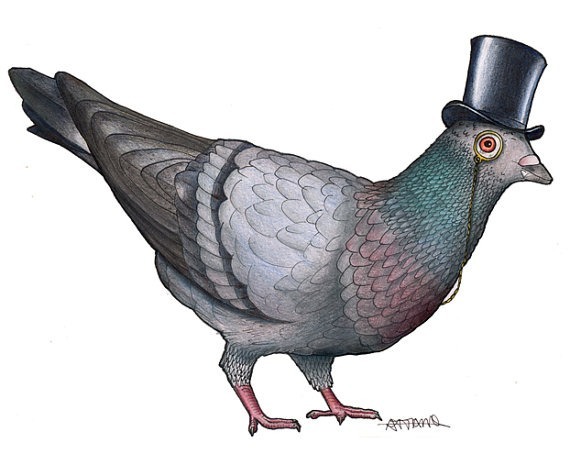 Maybe that's because regular pigeons aren't Dapper Dans and wearing top hats and monocles like this one. He comes as a print too for £12. Or on a tote bag if you don't want another picture but you totes need a new tote. My absolute favourite though is the bluetit in an umbrella hat because umbrella hats make me laugh. I defy you to look at this and tell me it doesn't cheer you up. His A4 print costs £10 and he also pops up on magnets with The Dapper Pigeon in a set of 5 for £10. I wish I could show you all of Alice's drawings because I love each and every one. They're traditional and silly which is what makes them great. Have a look through all her other birds in her Etsy shop. I bet you fall in love with them all too. HE'S GOT A MONOCLE! THE PIGEON HAS A MONOCLE! You are my daily read. better than a broadsheet any day! I'd love to nominate you for a Sunshine Award: details here if you ladies are interested.